Jang-Mi and Taeja have to get over their first big misunderstanding of Taeja “sleeping next to Minjoo” and Grandpa Hwang invites Jang-Mi over for dinner despite Mrs. Hong’s disapproval. Jang-Mi hangs up in a daze and walks out to hyperventilate in the courtyard. Taeja’s murmur that he wants to sleep more repeats in his mind. Then Taeja wakes up and Minjoo pretends to sleep. Taeja wakes her up and demands to know what happened and why he’s still asleep. Minjoo answers that she has no idea, she wanted to let Taeja sleep a little longer and must have fallen asleep. She also adds that she tried to wake him up but he refused to wake up – even when Jang-Mi called. Taeja tries calling Jang-Mi but she doesn’t pick up. The next day, Taeja goes to the shop and finds Jang-Mi there. She coldly asks what he did the other day and Taeja lies that he had work. Jang-Mi follows up by asking why Minjoo was there. Taeja realizes that he cannot lie about this and confesses that he was preparing something for Jang-Mi and Minjoo offered to help. Then, Minjoo bought him cold medicine which made him fall asleep in the car. Jang-Mi tells Taeja to leave as she doesn’t want to talk to him. Taeja has no choice as he’s kicked out and he goes back to work. However, he can’t really focus. Even when Joonhyuk brings in the reports on which he’s going to present on for the board of directors, Taeja asks Joonhyuk to cover for him as he wants to leave early… Joonhyuk reluctantly agrees but ends up muttering to himself that work is a game for Taeja. Then, Mrs. Na tells Jang-Mi to come home for a special dinner. Jang-Mi comes home to find that Taeja has prepared dinner for everyone! It’s a custom ramen for each person. Hah! Afterwards, Taeja and Jang-Mi go to a cafe where Taeja repeats that Minjoo was only helping him to prepare this cooking event for Jang-Mi’s family. He hadn’t meant to fall asleep but did because of the cold medicine. Jang-Mi sighs that she believes Taeja but she still doesn’t like the fact that Minjoo was with Taeja. Jang-Mi notes that her intuition is telling her that Minjoo still likes Taeja… her actions including naming Taeja as “my man” on her phone and the ring incident all points to Minjoo not giving up. Taeja tells Jang-Mi that she’s sensitive because of all of the recent changes. But, he promises to be more careful. Taeja goes home and brings another cup of tea for his mother. Mrs. Hong asks why he’s not yelling at her about tossing Jang-Mi’s pasta and he answers that Jang-Mi asked him not to be mad at her. Taeja then goes to his grandfather (and wakes him up!) to whine that his grandfather needs to more proactively help! So, the next day, CEO Hwang asks Mrs. Hong about inviting Jang-Mi over for a meal. Mrs. Hong immediately rejects the idea. CEO Hwang isn’t deterred and goes to the rice cake shop the next day to invite Jang-Mi himself. Taeja is there so they go back to work together in Taeja’s car. Grandpa Hwang is so happy he literally runs over to Taeja’s car himself. Meanwhile, Joonhyuk has a meal with one of the directors who is worries about how Taeja immediately got a Vice President position. He tells Joonhyuk that they have to be careful… they can’t let their company be given away like that and every person gets obsessive about their family when they get older. At the same time, Yuri visits Mincheol again. Mincheol suggests that they go see a movie after dinner but Yuri answers that she doesn’t like movies. She suggests that they go shopping instead. Mincheol ends up buying her a wallet. On the side, Chef Bong visits Ara’s bar where Mr. Kang is singing. Chef Bong gets jealous and gives Mr. Kang a first degree interrogation and finds out that Mr. Kang is married. That night, Mrs. Hong accuses Taeja of getting CEO Hwang to invite Jang-Mi over. Taeja of course denies it and Mrs. Hong notes that she said she didn’t want to join the dinner. Taeja frowns and whines that if his mom doesn’t join, he’s going to stop going to work. The next day, Jangsu is waiting for the elevator when Mrs. Choi arrives and spots both Jangsu and Mrs. Hong walking in. Mrs. Choi walks up and picks a fight noting that Jangsu is as rude as usual. Jangsu responds by telling Mrs. Choi to please leave him alone and walks off. As a result, Mrs. Hong goes home in a foul mood just as the dinner is about to start. She begins by asking Jang-Mi about Jangsu’s education and is dissatisfied to hear that Jangsu never went back to college after the army. Taeja reminds his mother that he also never finished college. But, then, Mrs. Hong begins to snipe about Jangsu making trouble including the time when Taeja had to get a settlement for Jangsu… Jang-Mi apologizes and Mrs. Hong dramatically sighs that she is in no mood for dinner. Mrs. Hong gets up and leaves. Taehee follows her mother out and reminds her that Jang-Mi is her grandfather’s guest. Mrs. Hong’s action actually insults CEO Hwang in addition to Jang-Mi. But Mrs. Hong could care less at this point. 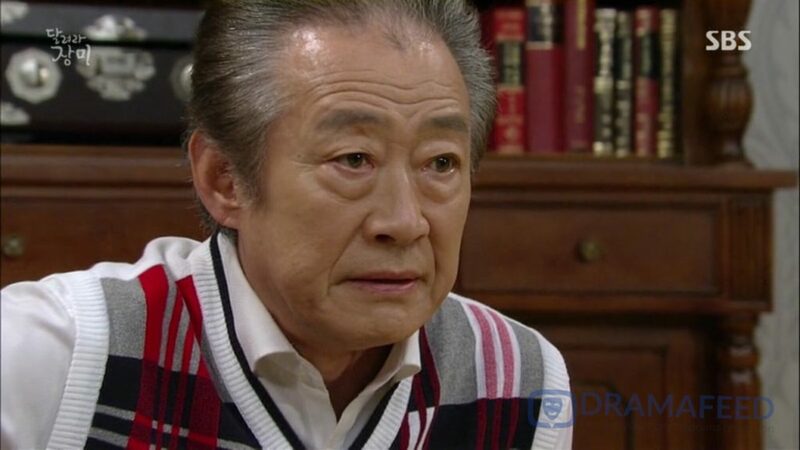 At the same time, Grandpa Hwang apologizes to Jang-Mi. Jang-Mi smiles that she didn’t expect Mrs. Hong to approve of her after one meal. She laughs that she got farther today since the other day, she got kicked out in the living room. Jang-Mi excuses herself to leave since it would be weird to continue to eat when Mrs. Hong has left the dining table. Grandpa Hwang goes to speak with Mrs. Hog afterwards and asks how she could be so rude to his guest. Mrs. Hong answers that she’s already been patient out of respect but she tells Grandpa Hwang that he’s a third party-Taeja is her son. She tells Grandpa Hwang to please stay out of the matter of Taeja’s wife. Grandpa Hwang storms back into his room and decides that he cannot leave it like this. 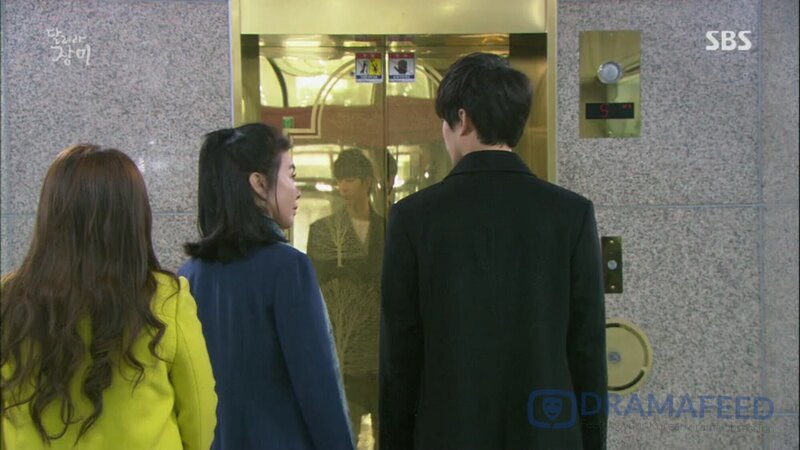 Taeja drops Jang-Mi off at home before going in to see his mother. Mrs. Hong sighs that he won’t understand that she’s trying. Except every time she decides to accept a fault of Jang-Mi another fault is highlighted. Taeja reminds his mother that all of her bad information is coming from Mrs. Choi who is Jang-Mi’s enemy. Of course, Mrs. Choi will paint everything in a bad light. The next day, Grandpa Hwang comes out with his packed bags and announces that he’s leaving. On a side note, why is the writer making it a point to highlight the fact that Joonhyuk is annoyed at Taeja’s lack of work ethic? Will we get an epic makjang battle between Joonhyuk and Taeja for SL Foods? If so, I hope they make it semi-realistic and not just that Taeja wakes up one morning and finds out that he’s actually a business genius so he just needs to spend one week not sleeping and suddenly he can fight with Joonhyuk over business strategy. That would just be the easy and half-hearted attempt to make Taeja look cool. But, I doubt it would work. We need some major character rehabilitation if we want Taeja’s character to begin swaying hearts! Run, Jang-Mi Episode 58 Recap by DRAMAFEED | Copy & Paste Guidelines – Always put a link back to the source.